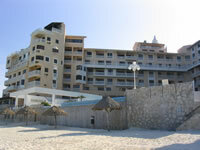 Welcome to our Cancun Plaza Condominium (see map), located in the heart of the Hotel Zone on the best beach in Cancun. Directly on the beach overlooking the incredibly turquoise green and blue water of the Caribbean Sea. 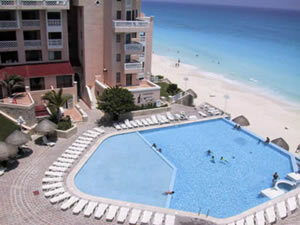 Cancun Plaza is centralized so that you never have to rent a car as you can easily access almost every attraction Cancun has to offer via taxis or the bus, which stops right at our entrance every few minutes. Taxis and buses are numerous for those day trips you will want to make to the nearby Mayan ruins of Tulum or other attractions like the underwater caves at Xcaret. 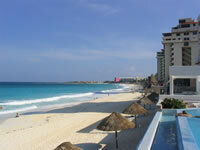 Of course, cars are available both at the airport and at numerous locations throughout Cancun.